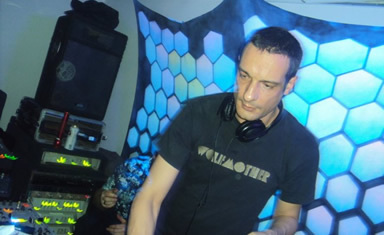 Kaptain Kairos is the Dj name of Stu Clark, resident DJ for Psychedelic Circle parties in London as well as an Aphid Records label DJ since its inception. Stu has been editor / coordinator of Dream Creation magazine since 1993, compiling the Dream Creation ‘Sound of Freedom’ CD back in 1998. More recently starting a new Dream Creation Promo series of CD's showcasing new underground talent: 'Intitiate Sequence' complied with PsiBindi and 'Organic Dream' with Chris Organic. His taste is uncompromisingly psychedelic yet groovy and his ideal time to play is 6am - going for groove over cheese. He has been DJing regularly to lively squat dancefloors around London with Mad Dreams Made Actual, Psychedelic Circle, Atom, Psi Box, Psychedelic Sound Force, Kamouflage, Secret Squirrels and others and will start producing tracks on his home studio in the coming months. ‘Complex Retracement’ is his first release made in collaboration with Jules Aphid Moon - available both on the most recent Dream Creation promo CD - 'Organic Dream' as well as Beatport.